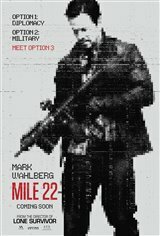 'Mile 22' Featurette - "Ground Branch"
'Mile 22' Movie Clip - "That's My Asset"
'Mile 22' Featurette - "Introducing Iko Uwais"
'Mile 22' Featurette - "Badass Women"
'Mile 22' Movie Clip - "Any Last Words"
"It’s a great movie for sure! Easy to follow. Some good action scenes. The only problem is the frequency between scene changes all the time. If you take the time and count you barely get to 5 seconds before the camera changes again and again. It actually gets to the eyes after a while. Plus it does no justice during the fight scenes. Too much scene changing. Tried to hard to make an already intense action movie more intense..."
"This movie was great. I would see this again. For what I went for"